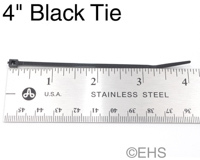 Pack of 100 mini 4" black wire ties. These are the best size ties for tying a few small cables together that will be handled because they are small enough to not get in the way. They are small though for example they often won't wrap around a bundled power cord.